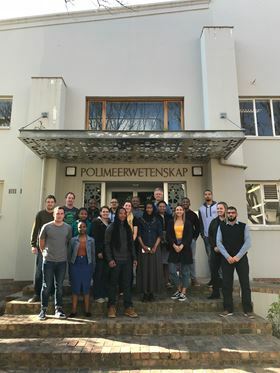 Group photo taken July 2018 in front of the Polymer Science building at Stellenbosch University. The synthesis of carefully designed polymers with complex architectures forms the basis of many processes, from the fabrication of macromolecular structures and molecular brushes to drug-loaded polymeric delivery vehicles for nanomedicine. 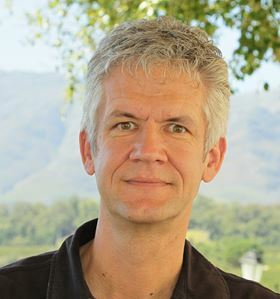 Bert Klumperman, who is the current holder of the South African Research Chair on Advanced Macromolecular Architectures at Stellenbosch University in South Africa, leads a research group focusing on the use of reversible deactivation radical polymerization (RDRP) as a versatile tool to create all sorts of polymeric materials. After receiving an MSc from the University of Twente, Klumperman spent over 10 years in industrial research at DSM Research before completing his PhD at Eindhoven University of Technology (TU/e) in 1994. He stayed on at TU/e as an academic, before relocating to Stellenbosch University. Since then, he has been elected fellow of the Royal Society of South Africa and received several awards, including the 2016 National Science and Technology Forum (NSTF) lifetime award. As well as authoring many publications, he gives frequent lectures at international conferences and is editor of Elsevier’s European Polymer Journal. Bert Klumperman talked to Materials Today about his current research and future plans. I got involved with Stellenbosch University as a visiting professor in 1998 and, over a period of six years, supervised 2-3 students via remote supervision and two or three annual visits while still working at Eindhoven University of Technology in the Netherlands. The current group is the result of the South African Research Chair on Advanced Macromolecular Architectures, which was established in 2007. The group consists of approximately 20 postgraduate students (MSc and PhD level), one post-doctoral fellow, one senior researcher, and one so-called Research Career Advancement (RCA) Fellow. The latter is based on an initiative by the government to increase the possibilities for young academic staff to make a career in academia. From a chemistry point of view, our main focus is on reversible deactivation radical polymerization (RDRP), with a major emphasis on reversible addition-fragmentation chain transfer (RAFT) mediated polymerization. Apart from that, we use other polymerization techniques as needed for the construction of specific structures such as, for example N-carboxyanhydride ring-opening polymerization. The research on RAFT-mediated polymerization is, to some extent, aimed at increasing the general knowledge about the technique but very often focused on the synthesis of a specifically designed polymer structure. The two polymers that play a major role in our research at the moment are poly(N-vinylpyrrolidone) (PVP) and poly(styrene-co-maleic anhydride) (SMA). In many of our projects, the ultimate goal is to develop a polymer for an application in the biomedical field such as a hydrogel or drug delivery system. The work on SMA dates back to the beginning of my career, when I started in industrial research at DSM Research (in the Netherlands). During that period, I was responsible for the polymer chemistry aspects of a polymerization reaction that was being scaled up to a full-size commercial plant. When I started my academic career in 1995, I found (and still find) SMA such a versatile and challenging polymer that I kept on doing research on many different aspects of the polymer and its derivatives. The work on PVP started thanks to a collaboration with BASF (Germany), who wanted to investigate whether PVP could be made via RDRP techniques. We once again discovered many interesting aspects of this polymerization reaction and nowadays use it routinely as an alternative for so-called PEGylation. The work on biomedical research themes stems from my own personal interest in this field. When I got the freedom to select my own research themes through the Research Chair, my research has gradually transformed in that direction. In the lab, we have all the necessary equipment to conduct polymerization reactions, polymer modification reactions, and so on. We further have a variety of techniques available for the processing of polymers, including a lyophilizer, electro-spinning, and small-scale extrusion systems. Within our building, we also have a wide spectrum of analytical techniques that are largely dedicated to polymer analysis, e.g. size exclusion chromatography, high performance liquid chromatography, Fourier infrared spectroscopy, UV-Vis spectroscopy, 2D-chromatography (HPLC-SEC), thermal field flow fractionation, asymmetric flow field flow fractionation, to name but a few. Several of these techniques are available thanks to my colleague Harald Pasch. In addition to dedicated analytical techniques, we also have Central Analytical Facilities at Stellenbosch University that house all major analytical techniques, including nuclear magnetic resonance (NMR) spectroscopy (various spectrometers up to 600 MHz), mass spectrometry, electron microscopy, confocal fluorescence microscopy, flow cytometry, and others. That would probably have to be the NMR spectrometer. The reason is that we do a lot of what we call in situ NMR, which means that we conduct a reaction in the cavity of the NMR spectrometer. This allows us to monitor the appearance and disappearance of compounds and get detailed information on how reactions take place. Our studies on the early stages of RAFT-mediated polymerization have made the largest impact, I believe. We discovered a very selective reaction at the beginning of the polymerization process that converts the original RAFT agent into a single-monomer adduct. Only after that reaction is complete, can the polymerization actually start. We coined the name ‘initialization’ for this process, which is now broadly adopted by the scientific community. Good students, good students, and good students! I can do whatever I like, but if there are no students who are skilled and who adopt my enthusiasm for the research that we do, nothing will come of it. In order to train my students to become independent researchers, I like to give them a lot of freedom to bring in their own ideas. This is maybe not always the route towards maximum output in terms of numbers of publications, but I truly believe that my students benefit enormously from my approach. How do you plan to develop your group in the future? We have recently started a number of collaborations in the field of styrene maleic acid lipid nanoparticles (SMALP), a technique in which derivatives of our SMA copolymers are used to cut phospholipid bilayers (also cell membranes) into nanodiscs. This turns out to be the almost perfect way of isolating functional membrane proteins. Although the current system already works well, we have plans to include additional functionality in the polymers that will allow a more diverse application of the technology. P. W. Reader, R. Pfukwa, S. Jokonya, G. E. Arnott, B. Klumperman. Synthesis of α, ω-heterotelechelic PVP for bioconjugation, via a one-pot orthogonal end-group modification procedure. Polym. Chem. (2016) 7, 6450-6456. I. M. Heyns, R. Pfukwa, B. Klumperman. Poly(3-methylene-2-pyrrolidone). Synthesis, characterization and evaluation of cytotoxicity. Biomacromolecules (2016) 17, 1795–1800. J. van Wijk, T. Heunis, E. Harmzen, L. M. T. Dicks, J. Meuldijk, B. Klumperman. 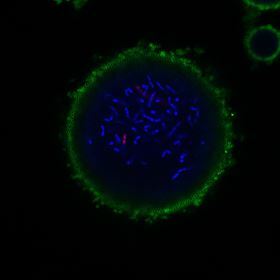 Compartmentalization of bacteria in microcapsules. Chem. Commun. (2014) 50, 15427 - 15430. R. Pfukwa, P. H. J. Kouwer, A. E. Rowan, B. Klumperman. 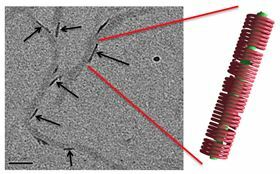 Templated hierarchical self-assembly of poly(p-aryltriazole) foldamers. Angew. Chem., Int. Ed. (2013) 52, 11040-11044. G. Pound, J. M. McKenzie, R. F. M. Lange, B. Klumperman. Polymer-protein conjugates from ω-aldehyde endfunctional poly(N-vinylpyrrolidone) synthesized via xanthate-mediated living radical polymerization. Chem. Commun. (2008) 18, 3193-3195. J. B. McLeary, J. M. McKenzie, M. P. Tonge, R. D. Sanderson, B. Klumperman. Initialisation in RAFT-mediated polymerisation of methyl acrylate. Chem. Commun. (2004) 17, 1950-1951.